When employers constantly go back to the same talent pool, odds are the pool will start to dry up. That’s the dilemma many west central Minnesota employers are experiencing. 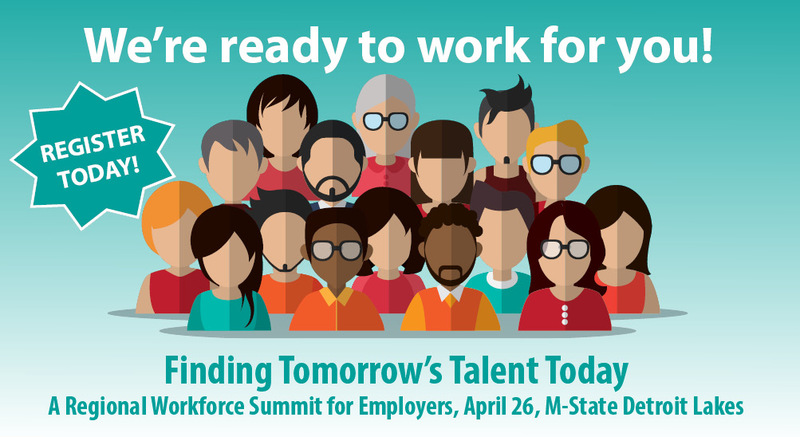 “Finding Tomorrow’s Talent Today,” Thursday, April 26, 9 a.m. to 1 p.m. at Minnesota State Community and Technical College—Detroit Lakes, is a regional workforce summit that aims to help employers solve their worker shortage issues by providing resources and information to expand that potential labor pool. Regional Labor Analyst Chet Bodin from the Minnesota Dept. of Employment and Economic Development will bring a regional perspective to Blazar’s talk by providing the most recent data on occupations in demand in west central Minnesota. Along with the speakers, area healthcare and manufacturing employers will share how they are tackling their own workforce shortage issues, and workforce development organizations will be available as employment resources for participants. Learn more details and register online at http://wcif.org/workforcesummit18.html. Several regional organizations are co-sponsoring the event: Rural Minnesota Concentrated Employment Program, Inc., the Minnesota Dept. of Employment and Economic Development, Productive Alternatives, West Central Initiative, Fergus Falls Economic Improvement Commission, Minnesota State Community & Technical College, Detroit Lakes, Lakes & Prairies Community Action Partnership and the Fargo VA Health Care System.